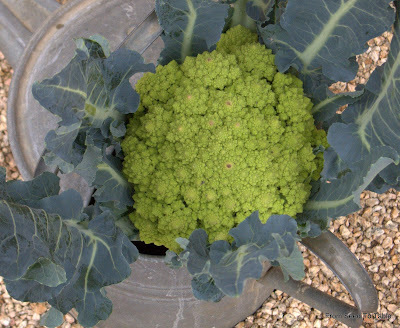 The Spigariello Broccoli was coming in at a nice steady pace, not too much, not too little. But then, we had a bit of a January heat wave and all the plants just went nuts. So there's a big bunch of it in my fridge and more shoots ready to pick. You know what that means, another recipe featuring Spigariello Broccoli. Heat the olive oil in a medium sized saute pan over medium heat. Add the garlic and red pepper flakes and saute a bit, don't allow the garlic to brown. Add the chopped Spigariello to the pan and a pinch of salt. Stir for a couple of minutes and then add the water to the pan. Bring to boil, then turn the heat to low and cover the pan. Braise until the broccoli is tender to your liking, it took about 15 minutes for my taste. There should still be a fair amount of liquid left in the pan. Meanwhile, bring another pan of water to a strong simmer for poaching the eggs. When the broccoli is done, remove it from the heat and set aside while you poach the eggs. (Sorry, I'm not going to give an egg poaching lesson here). While the eggs are poaching, place the bread slices in wide shallow soup bowls (I like to warm the bowls in a low oven first). Use a slotted spoon to portion the braised Spigariello onto the bread slices, reserving the braising liquid. When the eggs are done to your liking (I like mine with runny yolks), place one on top of each portion. Pour some braising liquid over each portion, using all of it. Drizzle with olive oil, sprinkle on some good flaky salt and a grind of black pepper. Serve warm. This made 2 main course portions. Macaroni and Cheese is my idea of comfort food. I still have fond memories of that bright orange mac and cheese from a box. But I'm grown up now and have become a foodie, oh ok, I confess, I am a Food Snob. There, I've come out of the box, if you don't like it, well.... whatever. But, what it means is that I can never go back to the box. Mac and Cheese must be made from scratch now. My latest version of Mac and Cheese also incorporates goodies from the garden. Years ago I found a recipe for baked macaroni and cheese with cauliflower and jalapeno peppers. That recipe has evolved into the version that I made last night and am posting today. Preheat the oven to 350F. Butter an 8-cup baking dish, such as an oval gratin dish, with 1/2 tablespoon of butter and coat with about 1/4 cup of the bread crumbs. Melt the other tablespoon of butter and toss the remaining breadcrumbs with it. Melt the 4 tablespoons of butter in a medium-size saucepan over medium heat. Whisk in the flour and cook for a couple of minutes, whisking constantly. Whisk in the milk and cook, stirring often (I switch to a silicon spatula at this point), until it thickens and just begins to boil, about 5 minutes or so. Remove from the heat and stir in the cheese. Season with fresh ground pepper and a touch of nutmeg. Taste for salt, I added none. Stir in the truffle butter if using it. Put the cooked pasta and Romanesco into a large mixing bowl. Pour the cheese sauce over all and stir to mix. Put into the prepared baking dish, packing it in a bit, and sprinkle the buttered bread crumbs over the top. Bake for 35 to 45 minutes, or until browned and bubbly. Start checking after 25 minutes (my oven is incredibly unreliable and should never be used for recipe testing!). Makes 3 to 4 servings, depending on your appetite! A glass of good Pinot Noir really helped to cut the richness of this dish. I saw the first wildflower on my hillside today - it must be spring! 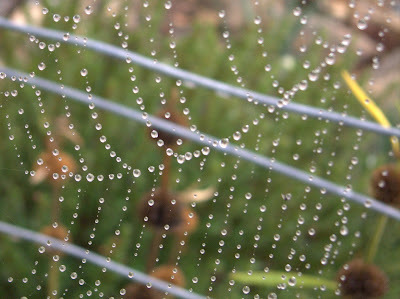 This one is actually inside the vegetable garden fence, otherwise I probably would not have noticed. It seems to be the very first one blooming. I took a stroll up the hillside where I normally see them and nary another blossom could be found. 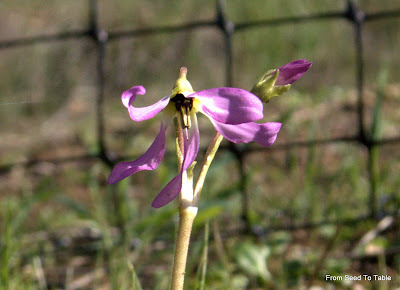 It's a Shooting Star (Dodecatheon, I think hendersonii, but not sure). Other common names for this flower are Mosquito Bills and Sailor Caps, personally I prefer Shooting Star. This is one of the colors it comes in. The colors range from white thru pink to magenta. It's one of my very favorite wild flowers, how nice that it's the first one to appear. The petals on this blossom are not a swept back as usual, perhaps because it's not fully open yet, not sure. 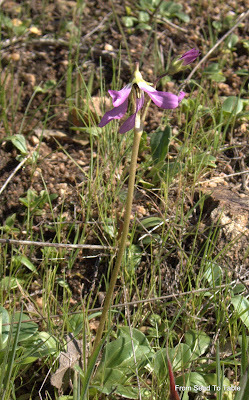 Dodecatheon is in the primula family. This species species needs a dry summer dormancy. 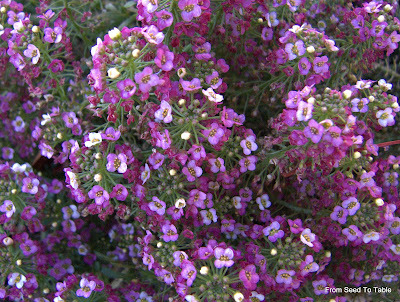 It mostly grows in the full sun on my hillside, but some also grow in part shade. Let me tell you, sorting out the different types of arugula is extremely confusing. 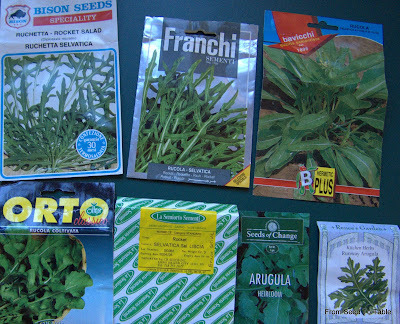 There are seven different packets of arugula seed arranged on my desktop, each one a different variety. This gets confusing really quickly, especially if you've forgotten (or never learned) all the ins and outs of botanical classification. 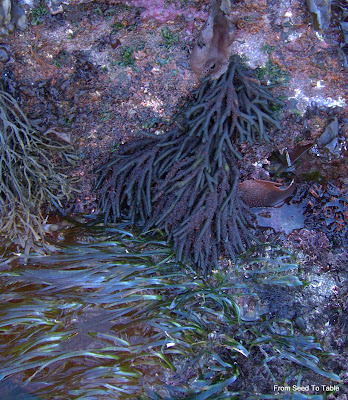 There are two genera represented here, namely Diplotaxis and Eruca. The genus Diplotaxis contains the wild types of arugula and the genus Eruca contains the cultivated types - ah, but of course there is an exception. Then there are four species, one belonging to Eruca and three to Diplotaxis. For those of you who have never had to take a course in botany, the botanical names of plants are usually stated in terms of --Genus species "Variety"-- genus and species names are always italicized, and the first letter of the genus name is always a capital letter and the first name of the species is always lower case. 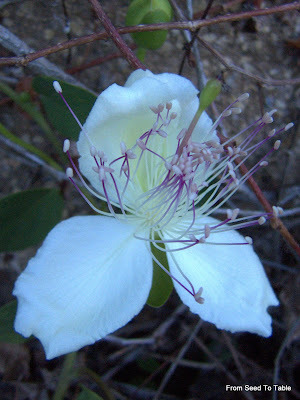 The variety is a selection of a plant that has been named because it has special qualities, it is not italicized. For instance, the Chioggia beets that I have in my garden now have the botanical name Beta vulgaris "Chioggia". So, look at these names... Ruchetta, Rucola, Rocket, Arugula. Thank goodness I don't have any french seeds, I would have to add Roquette to the list. The names are often used synonymously, but there are also many who make distinctions. Some would make a distinction between Ruchetta and Rucola as refering to wild and cultivated types respectively. I've seen the same distinction made between Rocket and Arugula. That's the problem with common names, they are imprecise. Yikes, what's a gardener to do?! Well, in my case, I'm just going to call them all Arugula. Ok, why so many different Arugulas, you might ask. It all started a number of years ago (can't remember how many) with a trip to Italy. I had oh so many salads with the best tasting arugula which I figured out was a wild type (ok, I will make one distinction). I came home with a packet of seeds, grew some out and ... oh yuck, this stuff is so strong! And so the search for that increasingly elusive taste memory started. All those wild arugulas have been too strong. Look at that, there are three different species of Diplotaxis, none of them is the one I remember. Oh, and about that one exception... The Rocket Selvatica Sel Liscia, which is an Eruca sativa, which are generally the milder cultivated arugulas, is actually a wild arugula. I'm guessing it must be an undomesticated forbear of the now common cultivated types. It was too strong. 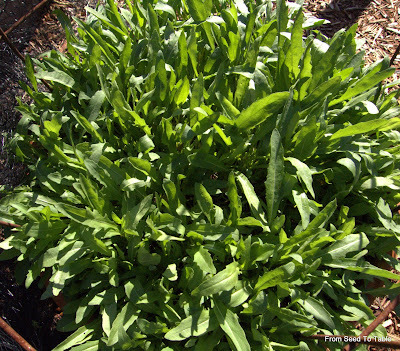 And guess what, there's one more wild arugula, Diplotaxis tenuifolia, that I've not tried yet! I don't know how I missed that one, it appears to be the most common species sold as wild arugula. I still haven't found the wild arugula that I had in Italy, (perhaps it's D. tenuifolia) but this year I've finally found a wild arugula that I like. Actually, that I LOVE it! It has a wonderful nutty flavor with just a little bit of heat that doesn't linger. drumroll . . . . . .
Now, I'll tell you how I used it today. It went into a Salami, Arugula, and Meyer Lemon Sandwich, the recipe for which we can thank Scott and Kendra at A Sonoma Garden. Really yummy sandwich, go check it out. And one more thing, my now second favorite arugula is Runway Arugula, a cultivated (Eruca sativa) the seed for which I got from Renee's Seeds. 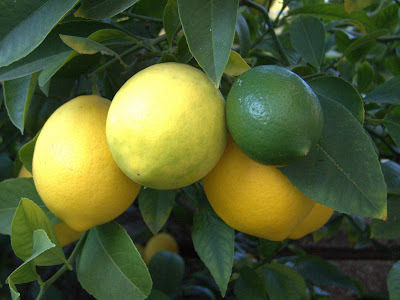 Halve the lemons crosswise and remove and discard the seeds. Quarter the lemons halves and thinly slice. Combine the lemon slices and water in a large heavy pot. Cover and let stand at room temperature for 24 hours. Thinly slice the chiles and add to the pot. Bring the lemon mixture to a boil over medium heat, reduce the heat and simmer, uncovered, until reduced to about 4 cups, about 45 minutes. Add the sugar and bring to a boil over medium heat. Cook, stirring occasionally, until the lemon is translucent and the jam just starts to thicken, about 10 to 15 minutes. It will still be very liquid but will set as it cools. Ladel into sterilized (boiled 10 minutes) 1/2 pint jam jars, filling to within 1/4-inch of the rims. Clean the rims and seal the jars with scalded rings and lids. Process in boiling water for 5 minutes. Makes 5 to 6 1/2-pint jars. Of course, you can omit the chile peppers and just make basic marmalade. The white pith of Meyer lemons is not bitter, so marmalade made with Meyers is quite nice for those of us who don't appreciate that quality in our sweets. Another variation that I'm thinking of is to add either rosemary or thyme, either with or without the chiles. 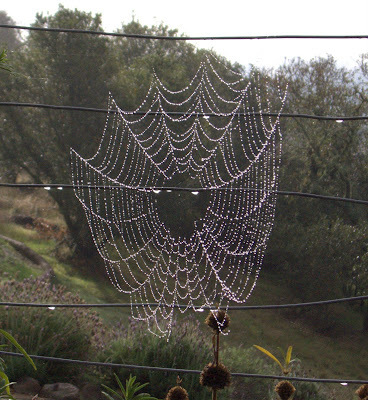 Mother Nature presented me with this beautiful display this morning. When I got to the vegetable garden they were there as well. Another head of Romanesco Broccoli nearly ready to pick. Oy, I found this thing hiding in the brassica jungle yesterday, which I'm not checking often enough these days because of all that bird netting. It's a bit overgrown, but I'm sure it will still be tasty. There also seems to be a bit of tip burn, possibly caused by a lack of calcium or not enough soil moisture (no rain for weeks, finally some last night and today - hooray!). It looks like the rest of the Romanesco heads are not going to be very large. 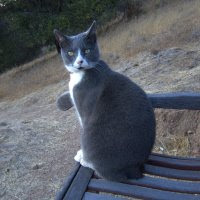 I'm not sure why, it could be weather related, it doesn't like temperature extremes, and the weather has swung from very cold (high 20's) to very warm (80+) in the last month. It could also be soil, a lack of some micro nutrient perhaps. Could be that lack of moisture thing. Also harvested while I was under that stuff: a whole bunch of Spigariello Broccoli, some Piracicaba Broccoli (nearly done now), and a few leaves of Portuguese Cabbage. Oh, and I pulled a bunch of carrots as well. My honey said this one was a keeper so here it is. I'm not quite sure how to classify this dish, it's not quite a stew, more like a warm salad. If you can't be bothered with pomegranate molasses (really you should try to find some, it is so good), leave it out or perhaps try a good balsamic vinegar, but start with half the amount since it is more acidic than the pomegranate. Sort through the lentils to remove any stones or other debris, rinse them and put them in a medium sauce pan. Add the water, sausages, thyme and bay leaf. Bring to a boil, turn the heat low and simmer, partially covered, until the lentils are tender but not falling apart. This could take from 20 minutes to more than 40 minutes, depending on how old the lentils are. There should be very little liquid left when the lentils are done, it may be necessary to add more water if they take a long time to cook. When the lentils are nearly done, remove the sausages and set aside until cool enough to handle, then slice the sausages about 1/4-inch thick. Remove the thyme stems and bay leaves when the lentils are done. While the lentils are cooking, put the onions in a medium sized skillet with the olive oil and fry the onions over medium to medium low heat (you may have to turn the heat down as the onions start to brown), until the onions are golden. Drain the onions through a metal sieve, saving the olive oil. Return the skillet to the heat with a tablespoon or two of the onion flavored oil (reserve the remaining oil to saute something else that would taste good with the onion flavor, like potatoes). Add the garlic and saute briefly, don't allow it to brown. Add the chopped broccoli to the skillet and toss to coat with the oil, add a few tablespoons of liquid (lentil cooking liquid if there's enough) and cover the pan and braise the broccoli over low heat to whatever degree of tenderness you like, most of the liquid should be gone. Add the sliced sausage, drained onion, and braised broccoli to the lentils, drizzle in the pomegranate molasses and stir everything together. Taste for salt, it may not be needed if the sausage is salty. Serve warm. Here's my effort at record keeping for seed sowing and planting out for 2009 by month. Variety names are shown in italics followed by the date the seeds were sown. Seeds sown in pots or cell packs are indicated. The list of plants by month is based on the monthly listings in my personal seed starting guide. 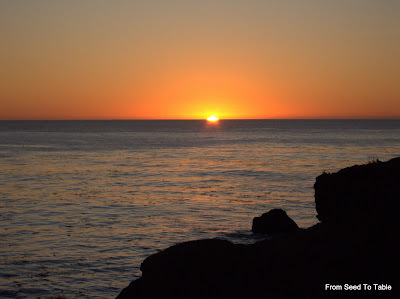 As the year moves forward I hope to keep it updated with current information for each month. I've been inspired by Daphne's seed planting schedule to come up with a schedule for my own garden. The greatest challenge is that my climate allows for year round vegetable growing and therefore year round opportunities for seed starting. So, rather than making a schedule just for this year's seed sowing, I've decided to tackle many of the possibilities for an entire year, any year. I've often missed the correct time for starting seeds for vegetables that are new for me or that I don't grow often, especially when I purchase seeds that can't be started until a few months later, such as the celery root that I'm going to try this year. So, this has turned out to be more of a guide for what can/needs to be started when. I've started with the seeds that I've purchased for this year and seeds that I already have that I intend to grow this year. 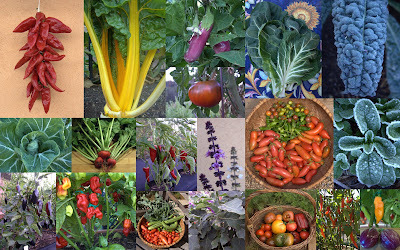 A number of commonly grown vegetables are left out of my guide because I have no intention of growing them this year. This is my own personal guide, not an authoritative guide for everyone in a similar climate. Should I decide to grow something new I plan (best intentions, really) to update my guide. 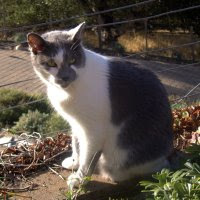 And if I'm really with it I hope to update it with information based on my own experience in the garden. I also hope to start keeping track of the actual sowing and planting out dates for each vegetable in a separate post. Much of the information presented below is based on my favorite gardening book for my region, Golden Gate Gardening by Pam Pierce. This book is an invaluable guide for anyone who wants to grow vegetables in the San Francisco Bay Area and along the California Coast. The book includes a table of Planting Times For Sunnier Microclimates that I've been consulting for years. 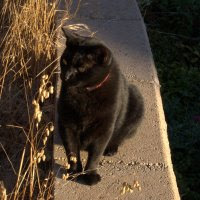 I believe I owe much of my gardening success to growing mostly by that schedule rather than by seed packet information which often does not apply to my climate. Should anyone who gardens in a similar climate have any observations, pointers, helpful hints, whatever, your comments are most welcome. All seeds are to be direct sowed in the garden or into pots or cells kept outside unless indicated otherwise. ---am just completely in the dark! Amaranth Greens: Apr?, May thru Jul, Aug? Beet: Feb thru Aug, Sept? Carrot: Jan thru mid Sep, late Sep thru mid Nov? late Nov?? Celery Root: Feb thru Mar?, Apr thru June, Jul thru Aug? Chard: Jan thru mid Feb?, late Feb thru Apr, May thru Dec? Cucumber: late Mar thru mid Apr?, late Apr thru mid Jun, late Jun thru mid Jul? Fava Beans: Jan?, Feb thru Mar, Sep thru Nov, Dec? Garlic: Jan thru Feb?, late Oct thru Nov, Dec? Kale: Jan thru Jul, Aug? 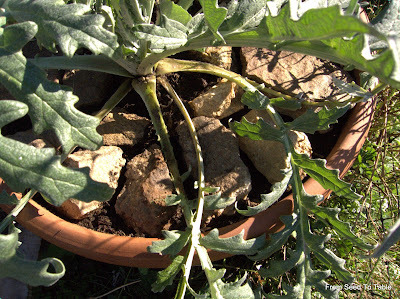 Kohlrabi: Feb thru Mar, Apr thru mid Jul?, late Jul thru mid Sep, late Sep?, Oct?? Peas: Feb thru Mar, Aug thru mid Nov, late Nov?? Portuguese Cabbage: ***Jun thru Jul, Aug? Radish: Jan?, Feb thru Apr, May thru July?, Aug thru mid Oct, late Oct thru Dec? Runner Beans: late Mar thru mid Apr?, late Apr thru May, thru mid Jun? Summer Squash: Feb?, Mar thru Jul, Aug? **Probably more dates will work but I haven't figured that out yet. ***Totally experimental since I have very little information. I've been starting seed in summer for fall and winter harvests. It's time to clean up the side bar and relegate most of the What's Growing Now to the What I Grew compost. Most of the vegetables were grown from seed, the exceptions are indicated by the plant source in parenthesis. I've added a few observations that I don't think made it into previous posts. I'm not sure what the problem was, but the cherry tomatoes did not do well in 08. The plants and the fruit were small. I suspect it was poor soil nutrition. The soil that I had brought in for the vegetable garden was really lacking in nutrients, something I didn't figure out until I had planted most of the summer vegetables. I had to feed most of the vegetables with liquid based fertilizer and the cherry tomatoes just didn't seem to respond very well. All the tomatoes planted in the "ground" started off slowly, but most seemed to come around ok with the fertilizing, especially when the weather finally warmed up late in the summer. Calliope and Kermit were the first eggplant to be planted and did quite well. Los Algorrobos and Rosita went in later, grew like crazy, flowered, and set little to no fruit. I harvested 2 eggplant from Rosita and none from Los Algorrobos. Plenty of problems with peppers this year, but most of that is well documented already and does not bear repeating. One problem that I didn't document, Elsita fasciated when it was very small, so I cut it down low, but it never grew into a healthy looking plant - basically a dud. What did well... Pimento de Padrons were great this year, once they started producing I was able to pick once or twice a week until late in the season. Aleppo is a wonderful cayenne type chile, not too hot and not too wimpy for my taste, and I managed to save a fair amount of seeds. The Thai chile overwintered from summer of 07 and looks like it may well stick around for 09. Ciliegia di Calabria produced nicely. Czech Black also grew and produced well, but other than it's color is a little ho hum. Aji Argentina turn out to be a very tasty, and perhaps a hardy chile, and I think I managed to save some viable seed. Doux d'Espagne, I had forgotten why I ordered this pepper, especially when it turned out to be a bell (I don't generally grow them), and it turned out to be quite delicious. The Piquillo plants were a bit runty, but they did produce a pretty good crop of very tasty peppers. Aji Pineapple, what a survivor, it's still hanging in there, nice spicy beautiful pale yellow chiles. I grew the cucumbers on one structure and the Painted Serpents pretty much shaded out the Garden Oasis cukes. Both plants seemed to be little affected by powdery mildew. The Painted Serpents produced nicely until late in the season. The zucchinis were my first clue that my soil was nutrient poor. Anyone who has grown them knows what weeds they can be, and mine just sat there and refused to grow much. Not necessarily a bad thing with zucchini, but I didn't plant them to just sit there and take up space. The Da Fiore Toscana and Rugosa Friulana were new for me this year, but I'm not going to pass judgement on their performance in 08. All the basils did well. African Blue is a beautiful plant that can grow quite large and is a magnet for bees. It will occasionally overwinter in my garden, but not this year. It does not produce viable seed so I generally propagate a few plants to overwinter indoors. I didn't get around to harvesting the orach until it was a bit too mature so I'm going to give it another try in 09. The colors are beautiful and what little I did try early on was very tasty and will be really pretty with the cutting lettuces. The orach seed heads were very pretty in flower arrangements. All three varieties of garlic grew well and I planted some more of each this year. The Tarbais beans were a complete and total failure, they rotted in the ground. Better luck, I hope, in 09. I planted the 08 crop of favas rather late and by the time the started to flower the weather was getting too warm and they set only a few pods. I saved every single pod for the seeds. For 09 I planted much earlier and am happy to say that every seed except one has germinated and is growing nicely (no seedcorn maggots on the crimson favas). I'm excited, the flowers on these favas are really beautiful! Everything below was planted in 08 but is still in the garden. The cutting lettuce mix is on it 3rd succession, one pot is starting to bolt so it will be cleaned out and replanted soon. The Arugula is finally recovered enough from bird predations that I can harvest it. I've been harvesting the corn salad leaf by leaf rather than whole rosettes, the leaves have been a nice addition to the cutting lettuces. 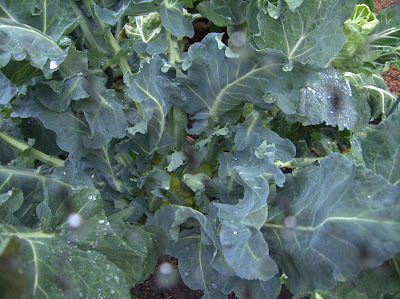 Plenty of remarks about most of the brassicas in previous posts. However, the olive leaf rapini seeds seem to be old, I had very poor germination so I'm going to get new seed. Atitlan was producing nice big tasty pods until the frost damaged them. The plants seem to be doing ok and I'm going to try cutting them down to force new growth for a spring crop. The birds munched most of the Sugar Snaps before they were 6 inches high. A few plants remain and I'm starting new plants in containers to add to the current planting. The beets and Scarlet Nantes have been and still are producing very nicely. 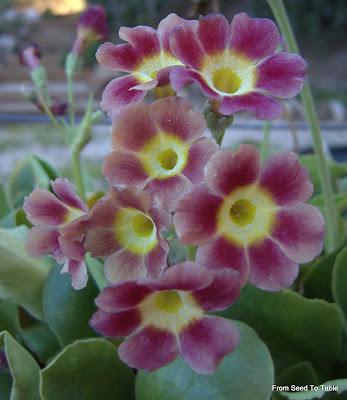 The Tonda di Pargi is an experimental planting in a pot. They are a small round carrot and are doing well, but one potful of plants will produce maybe 2 pickings. I have to plant a lot more to really make it worth while. I didn't expect to find much to photograph for GBBD today, especially after experiencing a couple of nights of what passes for a hard frost (wow, nearly a month ago!) around here. 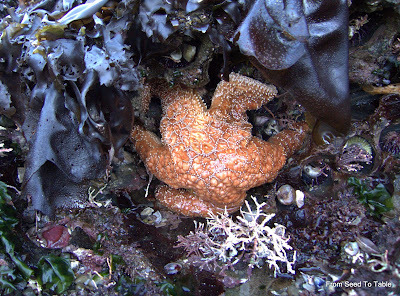 There are a few stalwarts still chugging along in spite of the cold. A couple of things really surprised me as you will see below. 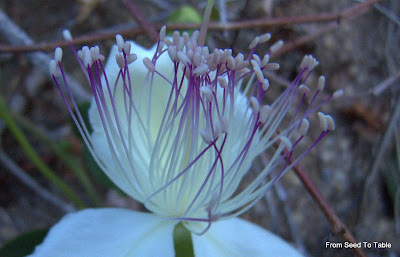 The first surprise, one of the caper bushes is still blooming. It's planted up against a south facing wall that must absorb and radiate back enough heat to keep the plant from going fully dormant. 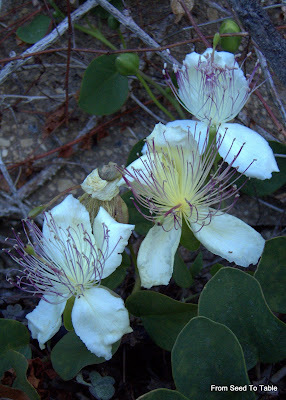 Most of the other caper bushes are in different degrees of dormancy, depending on their exposure. It probably helps that this variety has a low trailing growth habit, the more upright capers were hit harder by the frost. 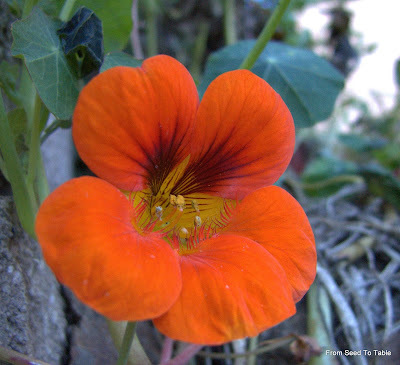 Next surprise, a nasturtium blossom. The plant is pretty well zinged by the frost, but like the caper, the part of the plant next to the wall as well as the lower growth survived the frosty nights. So, lets move on to the stalwart bloomers. 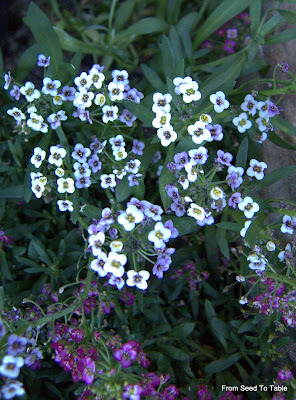 I let the Alyssum volunteer around the garden because the bees and other beneficial insects love it. 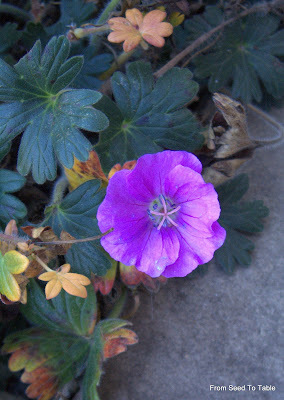 A volunteer geranium which I haven't identified. 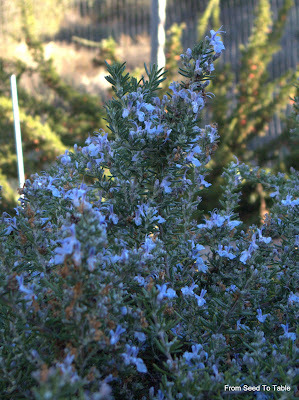 For Daphne, a photo of the rosemary in bloom. I wish I could send you some to brighten your day! The tiny flowers of Coleonema pulchellum "Sunset Gold"
Somehow I didn't get around to lunch today so I'm snacking on the remaining 2 slices of pizza leftover from Sunday night. Our current strange weather has allowed me to uncover and fire up the Beehive oven and do pizza. We love homemade pizza around here and I'm always trying to come up with new toppings that use vegetables from the garden. Someday I may get around to writing up my dough recipe that I've been perfecting over the years. It's just about right now, thin crust with puffy edges, not too soft, not too chewy. But, that's for another time. I want to record the latest toppings and get back outside before the sun goes down. Ok, that's it, gotta get back outside while it's nice! 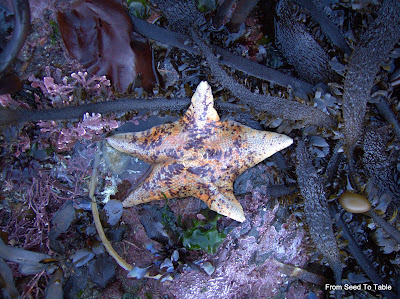 Bat Star, Coralline Algae, Feather Boa Seaweed, and more. 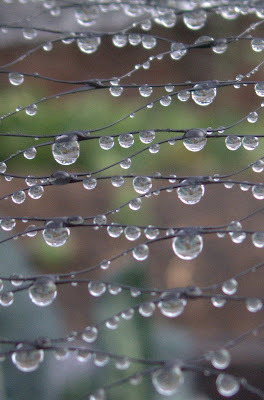 There is really nothing about this post that in any way relates to gardening, but I think most gardeners are nature lovers so I offer this up to you. 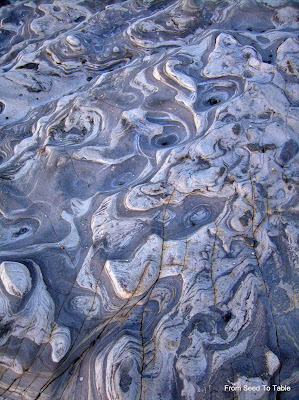 The moon has reached its perigee for the year so the tides have been at their lowest levels as well. 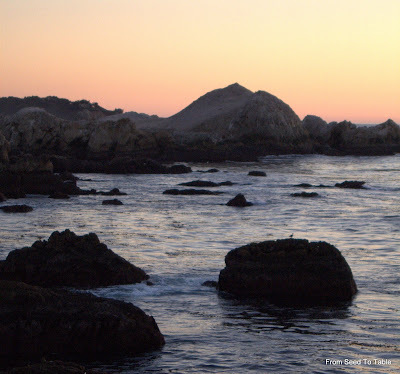 Fortunately, the extreme low tides are occurring during daylight hours. 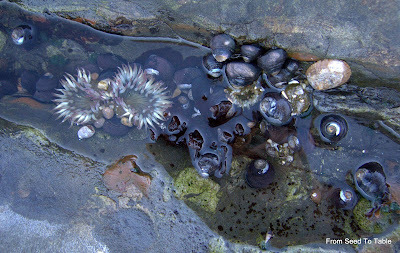 Yesterday the tide reached its lowest level at 4:15 pm which meant there was plenty of daylight to go explore the tide pools. It was a perfect day for the excursion, the sun was out, the sky was clear, the day was warm, and there was no wind - the weather really doesn't get much better around here! I took so many photos that I'm only going to post the highlights here (still a lot of photos! ), if you want to see more you can go here. 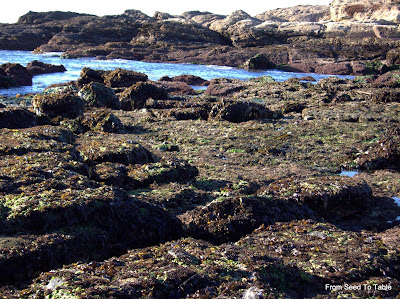 Seaweed encrusted rocks at lowest tide. 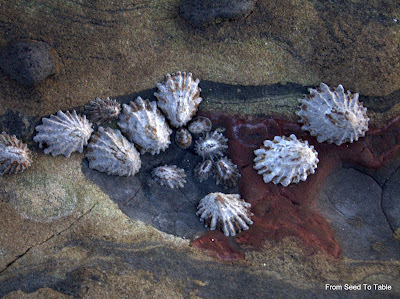 Sponges, Snails and Corraline Algae. 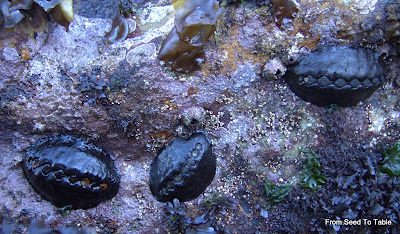 Chitons, don't know what kind. 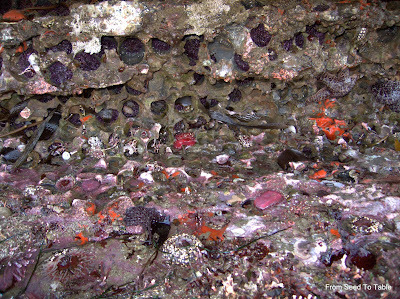 Each hole inhabited by a Purple Sea Urchin, looks like a condo complex! It's a huge condo complex. Evey hole bored by a sea urchin. 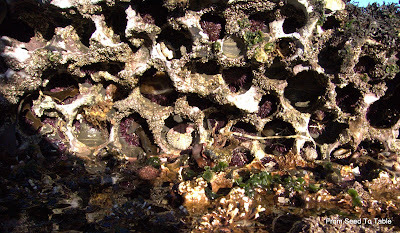 Coralline Alge encrusted rocks with some sea grass as well. 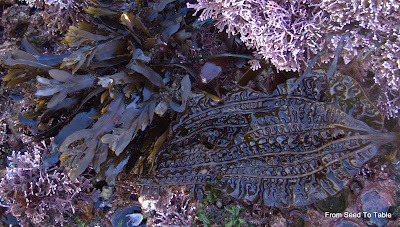 Seaweeds, don't remember which kinds. 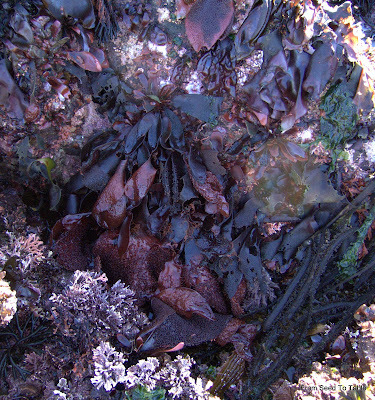 Seaweed doesn't have roots, it pulls nutrients from the water across its entire surface, thus the texture which increases surface area and increases water flow over the surface. feels like water logged dead flesh. 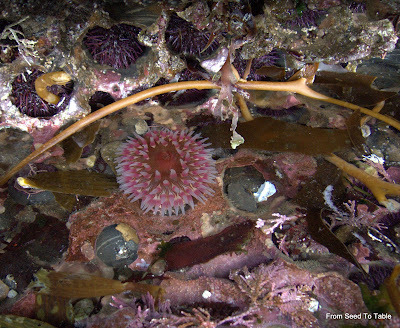 Some sea grass at bottom left also. There is so much in this photo that it's hard to describe. 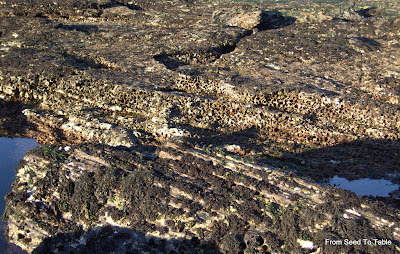 An interesting rock formation with dried seagrass which looks like hair. 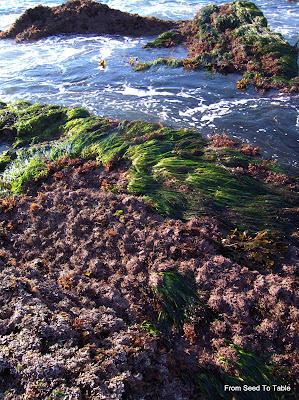 The seagrass will revive when it is immersed in sea water again. 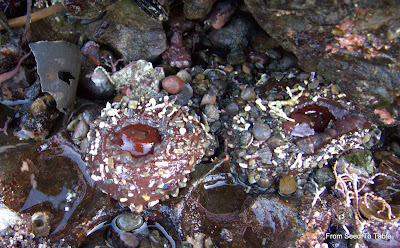 Anemones exposed and closed up for protection from drying. They remind me of Thumbprint Cookies! 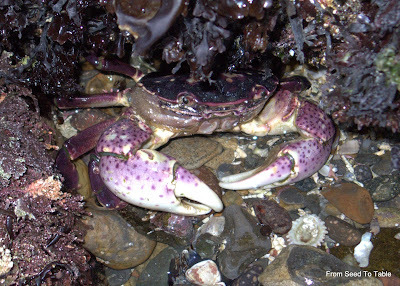 A gorgeous crab, don't know what kind. 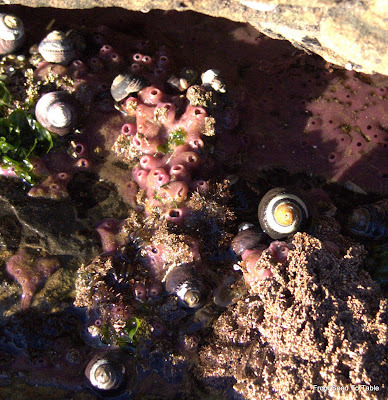 More Anemones and a bunch of snails. 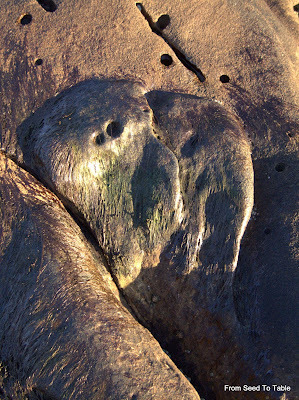 The rock formations are beautiful at this beach. The sun was setting as we left. If they keep eating my dinner I just might. After eating all those yummy nutritious garden fresh vegetables you know they're going to be succulent and tasty. After that... they moved on to the Olive Leaf wild arugula. That's under netting and in recovery. what next!? Why... the Cavolo Nero, Romanesco, and Broccolis of course! 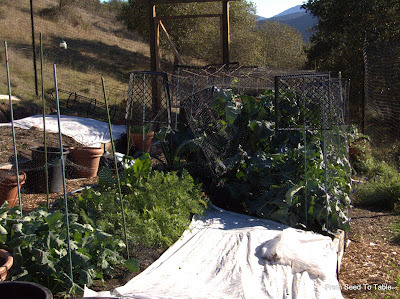 I spent way too much time today getting my brassica bed under netting - and this was the second attempt. Yesterday's efforts got me nowhere. The little monsters just pecked the leaves through the netting and they figured out how to get in and out from under the netting. So the feast continued. I got it all nice and secure this afternoon. 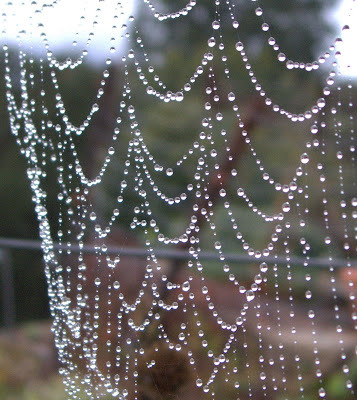 The netting is suspended above the foliage and fastened down tight all around. Then I went out to see how things were going. My little feathered fiends had figured out that they could get to the leaves by sitting on the net and their weight would allow them to sink down onto the foliage. arrgh So, one last fix was to plop a piece of rigid wire mesh on top of the whole get-up. 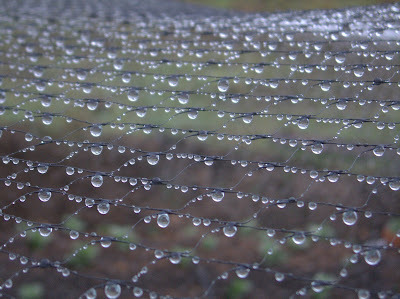 The fabric is protecting newly seed areas from you guessed it... birds! This garden will never be featured in some magazine full of pretty pictures. 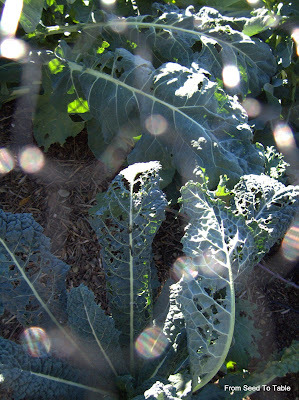 Lacey Cavolo Nero Leaves viewed through netting. Not a fancy new variety. The birds only like the tenderest parts of the leaves. And why are there rocks in the pot? Someone (yeah you know who) likes to get in there and kick the dirt out. I'm a bird lover, but my patience has its limits. What a pain it's going to be to harvest and tend my poor plants. Oh, and to forstall one helpful hint, flashy objects did not deter the birds. 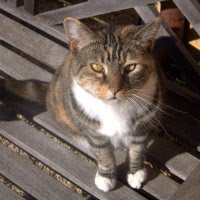 There is definitely one downside to not allowing my cats access to the vegetable garden.